We have seen, and will continue to see, market forces that seek to maximize profit potential with the assumption that human flourishing will be an inevitable byproduct. There are clearly problems with this assumption already. But with increasing automation and AI, there is no good reason to believe this will be remotely true in the future. Consider many (if not most) care-giving positions: home health care, teaching, child care and youth development, social workers, elderly care, animal welfare, environmental protection and cleanup. These and countless other occupations serve vital social functions yet have little economic incentive. People essentially commit to a life in poverty just to take on these careers - yet society would be nearly unbearable without them. Add to this the ongoing de-skilling of various professions or outright automation of entire industries and we have a very bleak future for most humans ("normal people") in the mid-21st century and beyond. So long as a meaningful life and sustainable living are tied to economic structures which reward disruptive, concentrated monetary accumulation, most people will continue to see their quality of life diminish as a small oligarchy of tech wizards and financial elite consolidate most available resources. 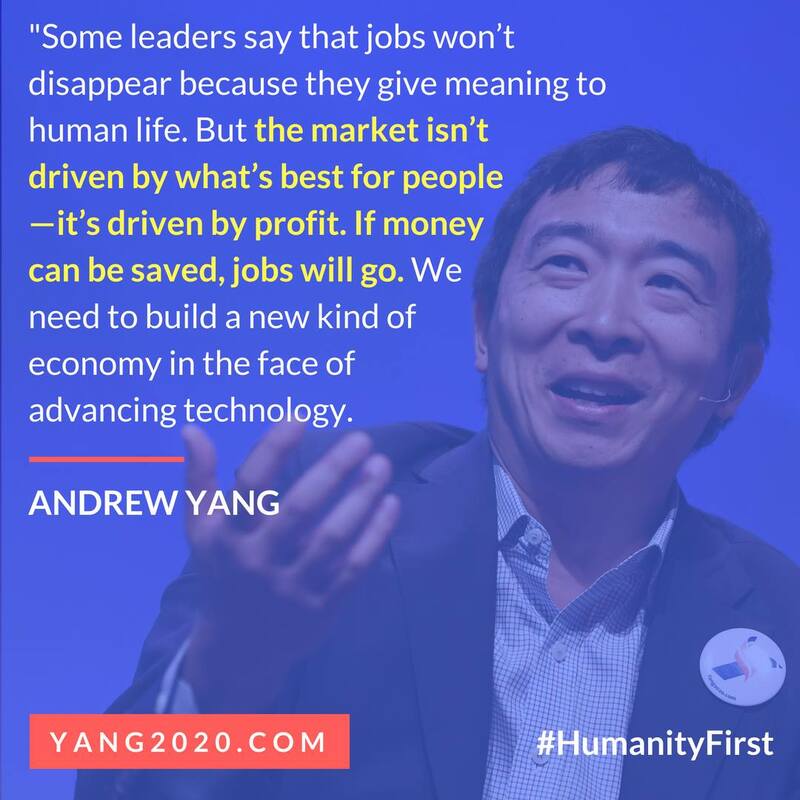 "The War on Normal People" author and 2020 Democratic presidential candidate Andrew Yang appears to be among the foremost leaders in the USA discussing this issue. He is certainly worth watching and listening to. Related to this, Google's AlphaZero AI has become the undisputed champion of Chess. And unlike previous software programs like Stockfish which were programmed by humans, AlphaZero taught itself to play Chess and became better than every human player... in four hours. AlphaZero is actually more creative than most human chess players - another metric that didn't seem likely just a few years ago. Machines appear capable of learning something new more effectively and efficiently than humans could ever hope to. The superiority of AI won't stop with games like Chess or Go, or even with automated cars and chat bots. Most of the jobs that most of us have will be performed more effectively by machines or with only minimal human oversight, and likely within most of our lifetimes. If we don't de-couple our sense of purpose from work, if we don't separate how we obtain food, housing, and other essentials from performing profitable tasks, there won't be much of an economy left in which most humans can participate. The more one pays attention to the developments in AI and automation, the more clear it becomes that we are on a collision course with very grim prospects for most people unless economic and social structures are significantly redesigned with humans in mind.